Posted April 21, 2013. 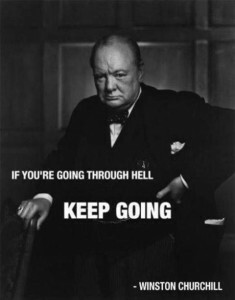 Winston Churchill was a wise man. I know what you are going through right now with your Lyme symptoms and Lyme disease is hell. Keep going. Make it to the other side. Be committed to 100% recovery. I used to tell my doctor that he wasn’t off the hook until I was 100% recovered. I used to ask the nurses about planning my Lyme disease graduation party! (They loved it!!) After I ran the Paris marathon I sent my doctor and the nurses a picture of me crossing the finish line. I was the patient who had come into their office, not being able to walk, so crippled by Lyme disease. It was an emotional moment for them. Lyme disease is hell. Keep going! I know Lyme symptoms are hell and Lyme disease is hell, but there is a way out. You do not have to spend your whole life in the crazy Lyme disease world. If you are still struggling, keep going! The only way out is through.